There are many theories as to how humans evolved to who we are today. 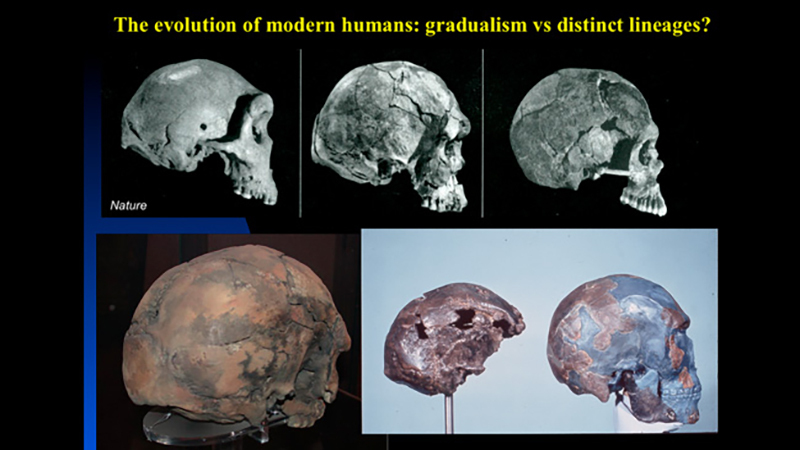 Fossils tell us that there once existed many human-like species, such as the Neanderthals, that had similar yet archaic skull shapes. Some people believe that there was just one ancestor of our modern species who evolved into the species we are today — but that straightforward trajectory seems too simple to be evolutionarily possible. Another theory suggests that there were many variations of our ancestors, but whose lineages did not persist as ours did. Eventually, modern humans replaced those sub-human species — but not before our ancestors interbred with them to create the variations of humans we have today. In this episode of the latest CARTA series, Behaviorally Modern Humans: The Origins of Us, Chris Stringer of the Natural History Museum of London takes us through his analysis of the fossil record to present his theory on how humans and our ancestors evolved and dominated the globe. Then, Michael Hammer from the University of Arizona discusses the possibility of interbreeding of human subspecies to create the species known as modern humans. Followed by Richard “Ed” Green of UC Santa Cruz who also talks about the possibility of interbreeding, but with species even outside of Africa. Watch “Behaviorally Modern Humans: Interbreeding with Archaic Humans” to see what you really know about your family history. Don’t miss other episodes in this new series!